I have never met a dad who wanted to be a failure at the job. On the other hand it is probably true that as fathers, none of us is the dad we would like to be. The busyness of life tends to get in the way – forcing us to let others take on our responsibilities. Do we concede our privileged, fatherly responsibilities by simply letting the school to teach our child’s mind; the churches to nurture the spirit; television, movies, video games and the Internet to provide entertainment; and the fast food restaurants to take care of daily nutrition? The brokenness and separation caused by sin compounds the difficulty of the day. 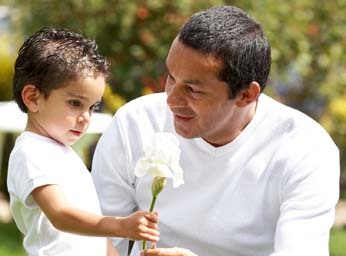 We know that a father’s presence in the lives of his children tends to yield good and measurable benefits while a dad’s absence may create an equally significant risk for harm. There are many circumstances that make it difficult for a father today to be present in the lives of his children (divorce, separation, unmarried parents, widowhood). But is a father’s presence limited to his physical presence? Don’t we have a perfect model to follow? God Himself is the perfect father. Often when thinking about God as Father we allow personal experiences with earthly fathers to influence how we see our Father in Heaven. But it should be the other way around! As the perfect example, God the Father shows us the standard of what an earthly father should be like. He is accepting, which is clearly shown through His display of mercy for humanity (Joel 2:13, Mic. 7:18, Ti. 3:5). He is accessible to His children because He has revealed Himself through His Son, the Lord Jesus Christ (Jn. 1:1, 14, 14:9; Heb. 1:1-3). We have access to Him through prayer in Jesus name (Mt. 6:9-13, Rom. 8:15, Gal. 4:6, Eph. 3:12, Heb. 4:16). He is actively present in the life of His children as He helps them in difficult times (Dt. 33:29, Ps. 28:7, Isa. 41:10, Heb. 13:6). He provides for His children’s needs (Ps. 31:19, Mt. 6:31-32, Lk. 12:7, 1 Pet. 5:7). He comforts them when they are hurting (Ps. 27:5, 103:13; Isa. 43:2, 66:13). As a Father He guides His children when direction is needed (Ps. 25:9, 48:14; Isa. 42:16; Jn. 16:13). He disciplines (or trains) His children not simply by punishing but by providing clear boundaries for them (Ex. 19:12-13, 1 Cor. 10:23). He guides them to the right path (Ps. 1:1, 16:11; Prov. 2:6-11). He corrects His children when they go in the wrong direction (Dt. 8:5, Prov. 3:12, Rev. 3:19). He sends warnings when disobedience and rebellion prevail (Dt. 18:15-18, Amos 3:7). He provides opportunities for His children to repent and be restored (Ezek. 18:31, Joel 2:12, Acts 3:19, 2 Cor. 7:10). He does all the discipline or training with love and for the purpose of restoration (Ps. 94:12, Prov. 3:12, Rev. 3:19). He is a faithful Father in keeping His promises (1 Ki. 8:56, 1 Cor. 1:9, Rom. 4:21, Heb. 6:18). He is also faithful in keeping His commitments (Dt. 7:9; Ps. 36:5, 89:1, 103:17). He is the good Father displaying His goodness when instructing His children in His ways (Ps. 25:8, 119:68). In His goodness He is a refuge to His children in times of trouble (Ps. 34:8, 46:1; Nah. 1:7). As a good father He wants the best for His children (Mt. 7:11, Luke 11:13). As a good Father He is loyal and true (Ps. 100:5, 118:1). Let us be careful, through the power of the Holy Spirit, to apply these characteristics in a practical way to our lives as fathers in the twenty-first century.